downstairs in our lower level sitting area. and then they "got married" with a little paint. for an eclectic Fall display. and then showcase a few Fall Projects. from Websters Unabridged Dictionary, 1879. I found one to fit. setting on top of a couple of black and orange vintage books. I love using old books to give something more "oomph". it even has the liquid measured scale. teaching book from the late 1800's. It's full of the most wonderful bookplates of animals. I thought this page suited our Fall theme. 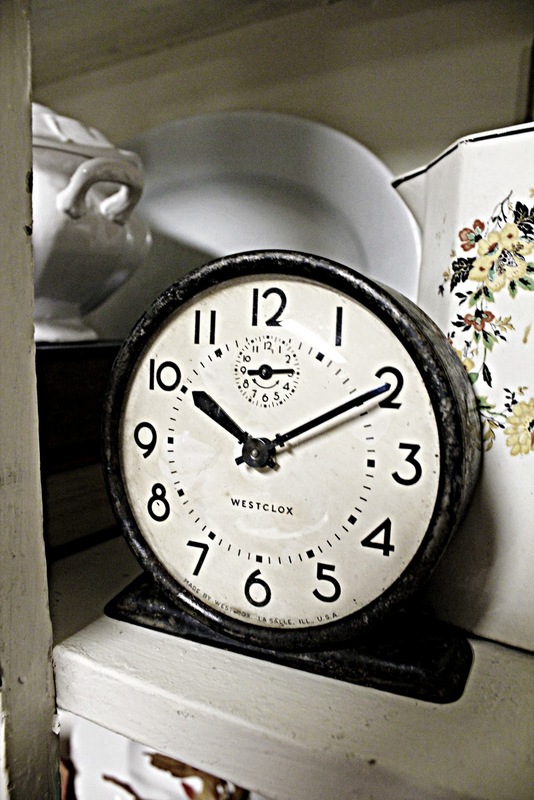 this black large dial alarm clock. and one of my Lefton Chipmunks from my studio collection. using plain old latex interior house paint. (please disregard the old school drapery headers over the French doors. Is that a good excuse...? Fall Decor and Project Party. Wow, your display and cabinet are both really beautiful. I just love it. I wish I had a cupboard to decorate for the seasons. This looks wonderful! I love that black clock and the suitcases on top! Thanks for the inspiration Debra! Your cabinet is lovely all decked out for Fall...almost a woodland theme! 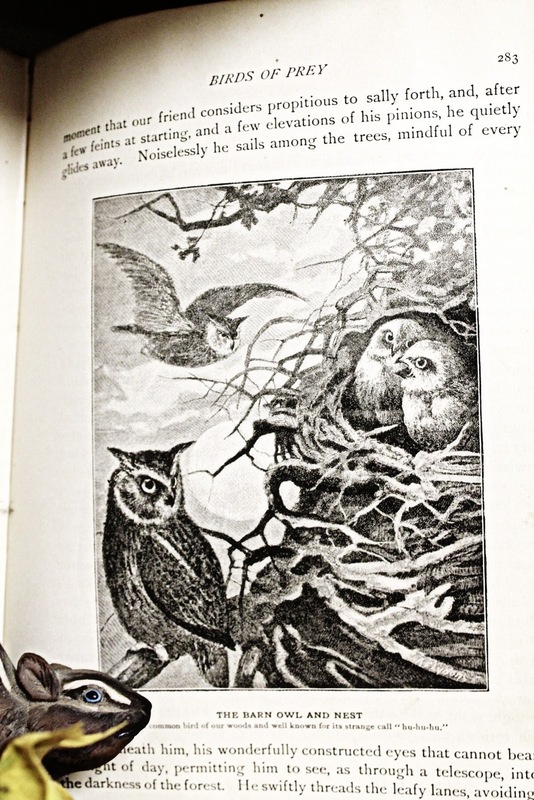 I adore the vintage book pages in this post!!! Those little woodland figurines are just darling along with your finds from the Graphic Fairy!Wonderful "lighter" side of Fall! I just love how you decorated your white cupboard! The pictures you printed from the Graphics Fairy are perfect for that. I also like how you vintagized your photos. I may try that sometime. Your white suitcases look good on top of the cupboard. My favorite Fall decorations for inside are in creams and browns. I may use a little rust, but not much orange. I like a subdued look. Your cupboard fits that bill! Gorgeous pieces!You've displayed them beautifully! I enjoyed seeing how you like to display all your pretty pieces. I'll have to check back for Christmas! This is the kind of decorating that convinced me I could decorate for Halloween. I love the vintage-y style! I love all of your pieces Debra! 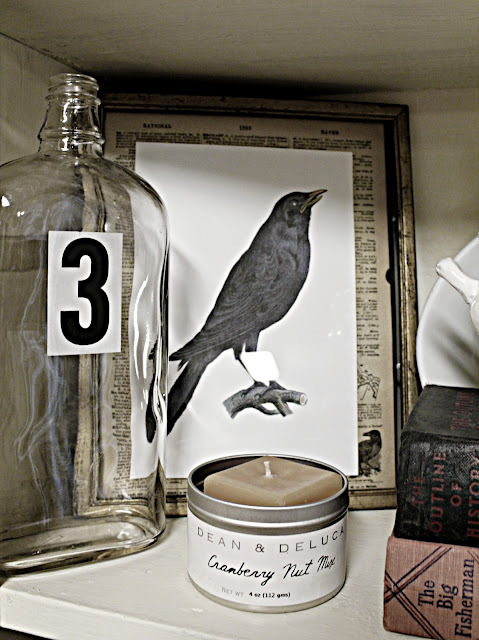 That crow picture and bottle with the label look great! Nice work. LOVE it! I like a space that each time you look at it you find something else you didn't see before! So fun and put together perfectly! Great idea to decorate your cupboard for holidays. 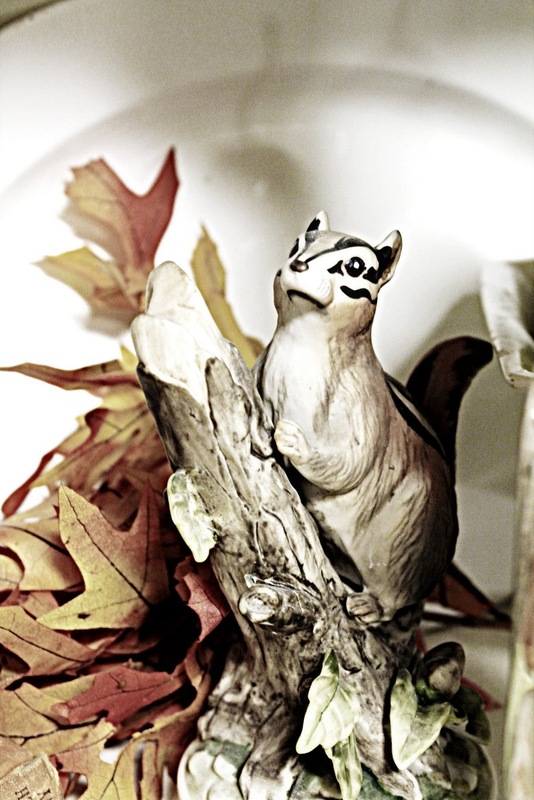 Everything is so pretty and with a "touch of whimsy".Cute chipmunk. So much fun. 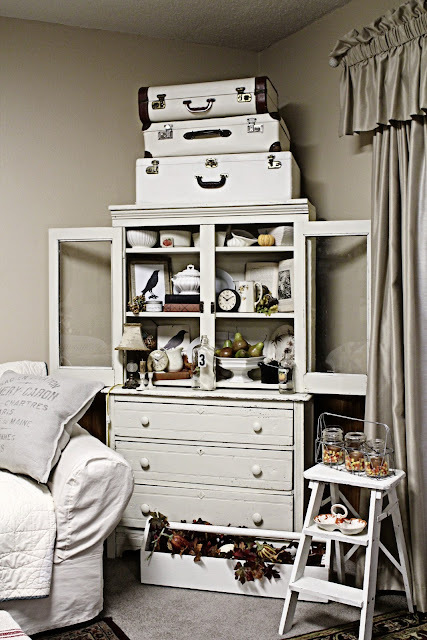 Love the suitcases and the cupboard! I love how you have decorated it for the season. Looks great, Debra. Love the printed crowe and that cute chipmunk. 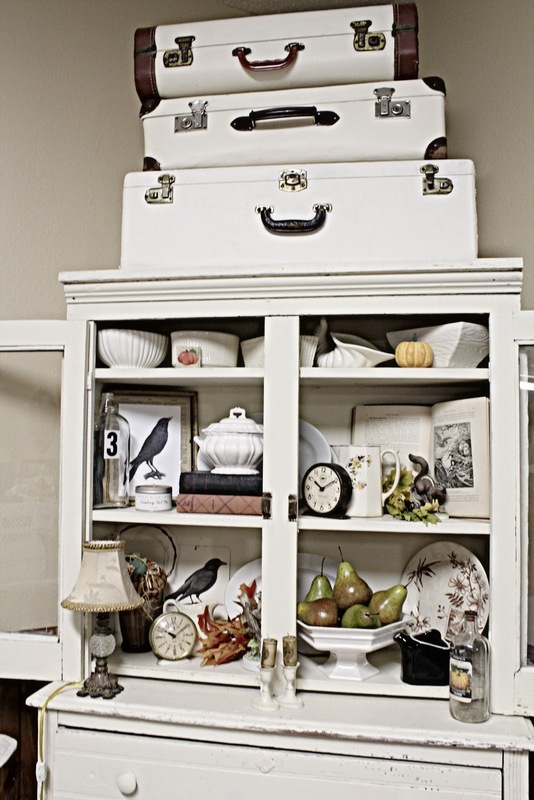 Your cupboard looks fabulous all dressed for fall! You have used some unique touches and I love it. What a great idea to paint those suitcases! How original. Debra, Love your cupboard and the way you have decorated it. The suitcases are a favorite of mine. 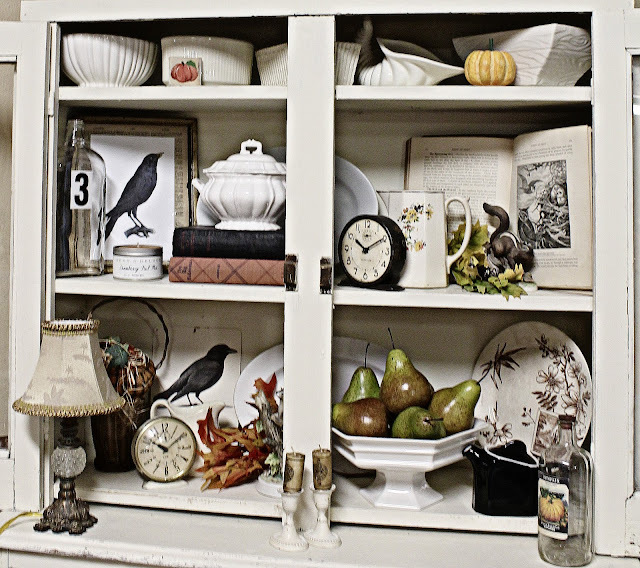 Your cupboard looks fabulous all dressed for fall! You have used some unique touches and it is best for attraction What a great idea to paint those suitcases! How original. Debra, I don`t even know where to start, -everything in your cupboard looks so wonderful. And I love you did it in White/Black tones. Love your craw picture ,and the pumpkin bottle- and the tureen---the lamp in front -and..and..
Have a lovely monday, dear. Lots of fun things to look at. You're very creative. Oh I just love it Debra! I just picked up a box of baby bens at an estate sale and can't wait to play with them! Love it all painted up and full of your pretties! The suitcases are adorable! I am still enjoying your header, too. This is lovely! I love each Fall display! What a great idea to paint the suitcases! I just love the entire cupboard! It's beautiful! I love everything you've done in here. I especially love how the white paint transformed that luggage! I love Picasa and Picnic--they really save the day when it comes to salvaging a mediocre photograph!!! LOVE your Fall cupboard, Debra. 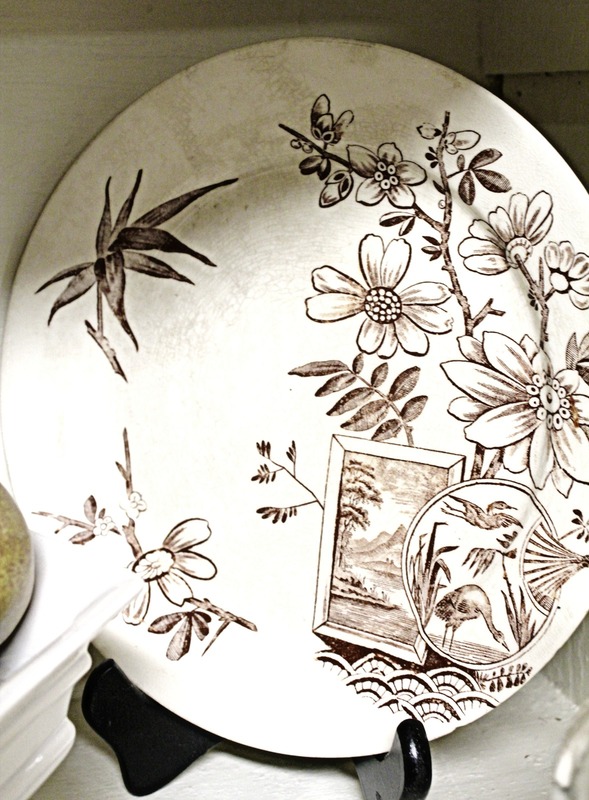 Crows and pumpkins and all the lovely china touches! Yum! Hope you have a wonderful week. Its a lovely cupboard and you have decorated so nicely for the season....blessings on your week. Looks very pretty and fall-ish! That crow and the old bottle are my favs!! Grown up or cute I like it lots! oh, I love that cupboard. It is beautiful. Oh, so beautiful, Debra. I love the unifying colors and your vignettes. You have such a great eye. gorgeous cabinet, debra! love the painted suitcases! Just gorgeous Debra. 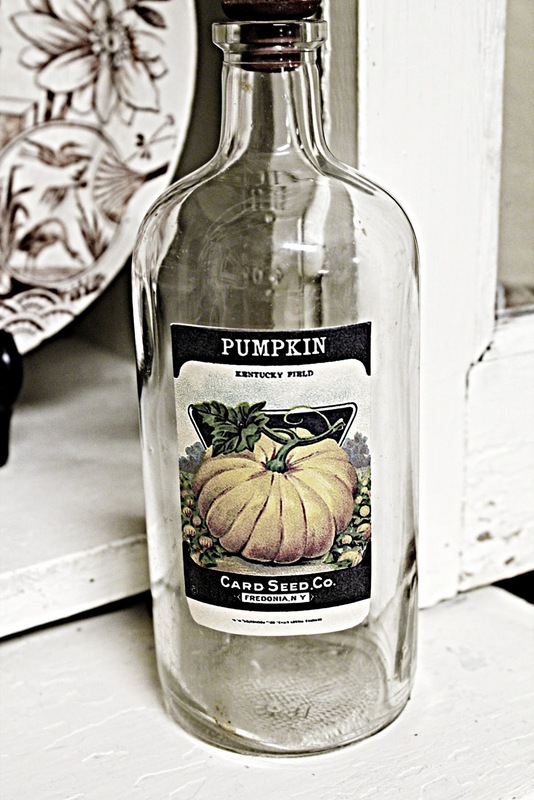 I love this old vintage take on fall decor. Looks fabulouso Debra! I love that clock too. All that black and white looks great! I love that you have a "holiday cupboard." What a fun spot to decorate for each season! Elegant, and not too Halloweeny. I just Pinterested this post, I loved it so much! Especially the squirrels. I have a pair, but they aren't Lefton. You gave me tons of ideas! Just found your blog, and there isn't a thing I don't like! Lovely Fall Display! Such a pretty display! I'm pinning your cabinet. O'Debra all your touches of fall looks gorgeous....love it all! Gorgeous is the word! Love all those fall arrangements. The autumn cabinet looks fantastic. Thanks for sharing. 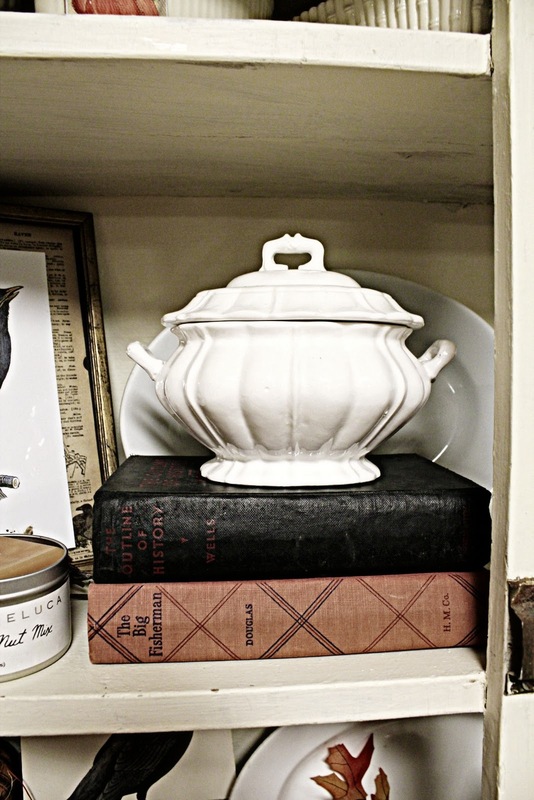 Lovely vignette in your cabinet. Love the crow pictures and the chipmunk! The contrast with the black is outstanding. I am a fan of picnik too. Love all your Collections and style. Everything is just beautiful..and I had to laugh. It's like me pointing out my old verticals that need to be replaced..someday. Not now, but someday. I thought they looked just fine! I loved your suitcases! What a great look you achieved! I loved every single thing!! What a fun display of your lovely things! Love it Debra!! So much gorgeous eye candy! LOVE those crow prints! It just looks FABULOUS!! And those suitcases painted?? Pure genius!! Debra, I love this look for fall. Don't get me wrong, I love all the orange and gold too but this is just gorgeous. The teaching book page is a perfect touch. I love what you did. The whole look is amazing. I especially love the suitcases on top. Looks great and great for storage. Function & beauty in one! Beautiful! Just a subtle touch of the season...perfect! I just enjoyed your tour of your holiday cupboard. So many wonderful and cute items. This cupboard is something to crow about! Love, love, love it! Thank you so much for linking up. Beautiful and what fun to change it up for the delish fall season! Looking forward to your fall party! Great mix of pieces, Debra! Love those suitcases on top, too! Thanks for linking up to The Talent Scouting Party at WhisperWood Cottage! Wow, that was beautiful. I just saw what I think should be one of the contenders! Always beautiful work, Debra! Great! I never though about painting a suitcase. I have an old blue suitcase with vintage lines but I don't decorate with blue. Gotta go find some paint!